The jobs market is colossal – on our doorstep just take the £10billion Colindale regeneration scheme and the £6billion Brent Cross Cricklewood area plans to get a sense of the potential. Construction is big business in the UK. In 2012, construction was worth £83 billion to the economy. That is the same as thirty-three years’ worth of turnover at Arsenal Football Club or building the London Eye one hundred times. Over two million people work in construction in the UK, around 260,000 of them in London alone. You could find yourself working for a wide range of people. Private housing or commercial property accounted for over half the new work coming in at the start of 2013 but a fifth is from the public sector, like the government or local councils. So you could also be building schools, social housing or even taking part in huge infrastructure projects like Crossrail. The new Construction Skills Centre at Colindale fundamentally changes the way Construction Training is delivered at the College, and allows us to respond robustly to the changing needs and demands of employers and the sector. 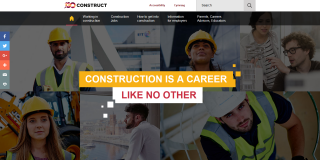 Want some good advice and guidance about the construction industry?